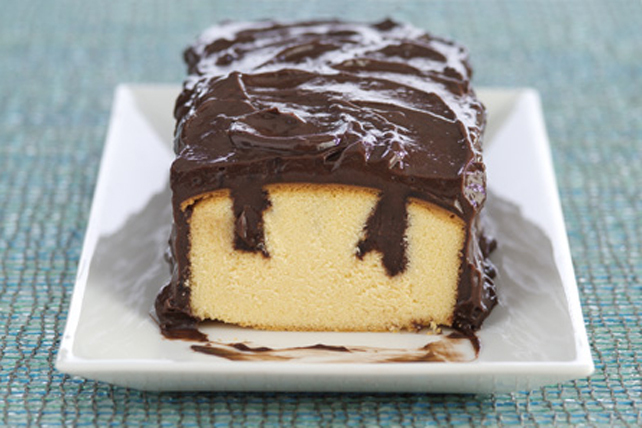 Kids are delighted when this chocolate pudding-frosted cake is sliced to reveal pudding stripes inside! A purchased pound cake makes it extra easy. Remove pound cake from package; place cake on serving plate. Poke 25 to 30 deep holes in top of cake at 1-inch intervals, using round handle of wooden spoon. Beat pudding mix and milk in medium bowl with whisk 2 min. Immediately pour about 1/4 of the thin pudding evenly over cake and into holes to make stripes. Tap plate on counter to settle pudding in holes. Pour 1/3 of the remaining pudding over holes. Tap cake again. Let remaining pudding stand several minutes until slightly thickened. Use to frost top and sides of cake. Prepare using your favourite flavour of Jell-O Instant Pudding.